Ranked from 23 ratings. Score is adjusted from raw score by the median number of ratings per game in the jam. The mall parking lot scene, in which Marty McFly first time travels while escaping the Libyan terrorists. Does your game or video link contain movie spoilers? The music was written pre-jam, but otherwise everything was created within the 10 day period. How many members in your team? Anything you want to say to players before they play? 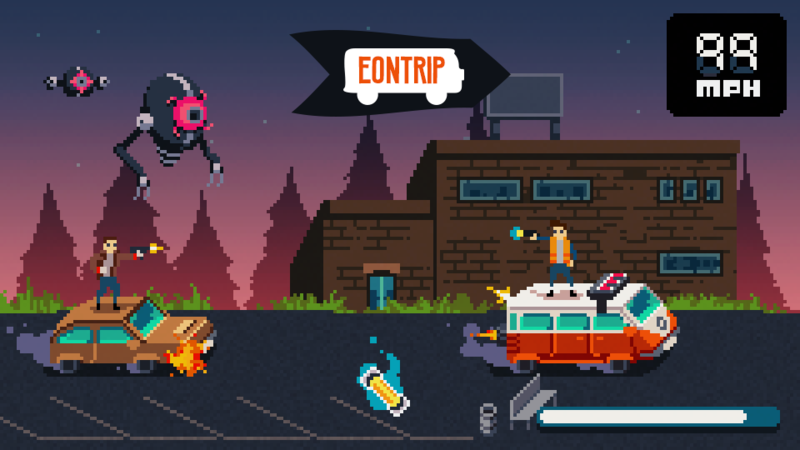 The initial idea of Eontrip is based on the movie scene, but there were lots of creative freedoms taken in order to make it unique. Expect lots of other updates after the game jam is finished. Controls can be found on the game page. Excellent 10/10 super fun endless driver through space and time! awesome art and great music/SFX! 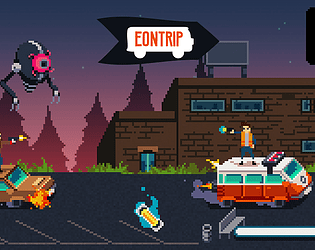 This game has lots of potential, it's unfortunate that it appears you ran OUTATIME before finishing it? 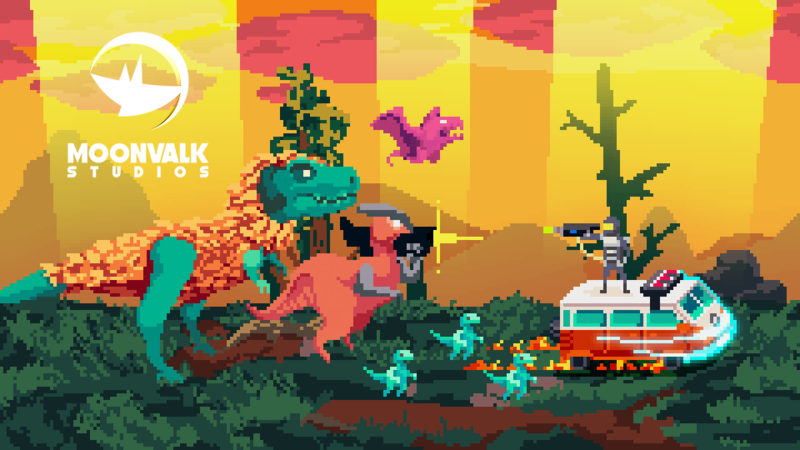 It certainly looks gorgeous - that's some great pixelart there! I had to guess the controls, but they were pretty straightforward. Love the artstyle. The van's hitbox seemed a tad larger than the van istself. And I had too much fun just mousing over the buttons in the menu, that is an oddly fun sound you found. Things for the future of this game, healthbars, ammo, and have obsticals slow you down. Great job! Thank you! I actually made the menu sounds from scratch, might have spent too much time on them sadly haha. All of that and more is actually planned! Cheers. Great graphics! But I could not understand the objective of the game. There seemed to be no consequences on the actions other than knocking down the lizards. Due to a lack of time management, lots of features didn't make it into the game yet. In a future update there will be much more to do as well as a scoring system and story elements. Thanks! Sorry to hear that. The game looks great and it would be very good if you could finish it properly. Definitely the one I have had the most fun playing even though I wasn't taking damage and shooting things was optional. Pixel art was awesome, sounds were good, controls were fluid. Here's hoping for a full game! Thank you for the compliments! I'm hoping to adopt this project into my weekly schedule and update it pretty regularly. Would love to see you do some work on this, so good. Yes, it looks like some time travelling hooligans have some explaining to do ahaha. :) Thank you, I will be spending a lot more time on this project- no worries! I saw previews of this before the jam was over and was really taken aback by how much you were able to get done within the time constraints - I didn't expect multiple levels' worth of assets! Sorry to burst your bubble, but the game is not bugged- haha. I managed to create a ton of art assets (lots with full animations) pretty early in the jam, but well over half of the jam days were spent working at my full time job. It was definitely my lack of time management: I should have focused on a few enemies and mechanics rather than the whole plethora. In spite of the very unfinished product, I am glad you enjoyed the bare boned experience I had to offer. Thank you for the kind words! I will absolutely be continuing development on this project in the future. The pixel art, animation and UI was fantastic! Too bad you couldn't get the mechanics finished but you've got something! Thank you very much! It was a combo of too large of a scope and having less time than expected during the weekdays, but I am still very happy with how this release turned out. Hopefully I can mold this into a stunning little arcade game in the near future. Feels like you pulled a bit of influence from the other great Michael J Fox flick, Teen Wolf (Van Surfing). :) Absolutely love the visuals and can see where you were going with the game. A valient effort. Thanks for noticing that one! If only I had a bit more time during the jam, more of the movie connection would have shown through. But thank you for the compliments, I am excited to see where this project goes from here on out. I really like the graphics, the pixelarts are very nice, but as you have already said, the game-mechanics don't quite work yet. You speed up while breaking and the enemies don't really harm you. But it feels like a very solid game, which could be extended to a very nice game! Keep working on it, it seems like you are a skilled gamedeveloper! If you want, you can check out our entry "Between the Worlds" too, would be cool! Thank you much! I'm hoping to shape it into a larger scale project in the future, with a possible mobile release. I will definitely give your entry a play. Haven't had much time to check out other entries yet, but I will have tomorrow off, finally. Thank you! Hit the nail on the head- lots of the features ended up incomplete. I had to scrounge together what I could in order to make the jam deadline. My scope was much too large for the 10 day period (minus my full time job; happens every time!) and lots of gameplay elements were lost, as well as some story pieces that were going to better connect it to the film, but just never found their way in. Regardless, thank you for the feedback and I will be continuing development on this title. I think that it could bloom into a great little arcade-shooter! best of luck! it's an extremely impressive product for such a short time. Thanks again. I'm glad I could pull off everything I could within the jam constraints. And I may have to take you up on that offer when I'm available to jam again! Teamwork makes the load much more manageable, and I am always willing to collaborate.